Really nice templates for speaking question 5. Could give a link to to the transcript or audio conversation for the answers? Hello, sorry for responding so late. I actually don't have the transcripts for the audio conversations. thanks very much for your really helpful sample answers. Thanks for shearing informative information.This information is very help full all TOFEL Preparation. Great advice, but please know that there is a difference between "advice(s)" and "advise(s)." For example, "the man/woman advises him/her." It is not "...advices him/her." "Advice" is not a verb. 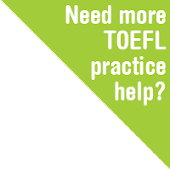 Nice information and blog about toefl speaking 26.